With all this talk about cloth diapering on vacation and using prefolds or flats as the easiest option, I thought I'd run a repost about the pro's and con's on both prefolds AND flats. Have a great Friday everyone! You're looking to go cheap on the cloth diaper journey and you've narrowed it down to flats or prefolds. But which is better? Which will be a good fit for you and your family? In today's post, we're going to look at the pro's and cons of each. After that, you can be the judge. Prefolds: Let's start by defining a prefold. 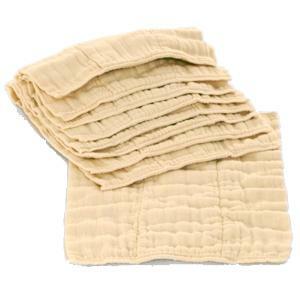 A prefold diaper is rectangular in shape and made (most often) of cotton, either bleached or unbleached. It is layered in three separate sections or panels, most often with four layers on either side and eight down the center where the most liquid is deposited. Prefolds are available with as few as six layers down the center panel. 1. Prefolds are fairly cheap. In fact, this is one of the cheapest ways to cloth diaper a baby right now. 2. Once you learn a few different folds, they're pretty easy to use. And honestly, they can be folded easily in three and laid into a wrap-style cover. 3. You can dye them different colors or even embellish them with embroidery to fancy them up. 4. They have a decent size range, which means you'll be able to use them for awhile before sizing up. 5. They wash clean very easily and don't often hold onto smell or detergent, at least in my experience. 6. Because of the simple design (no aplix, snaps, or elastic), prefolds last a long time. 1. Prep time can take awhile. You have to wash them a lot to get them ready for your baby to use. 2. While they can be easy to use, there is a learning curve if you're folding. It may take you awhile to get it down just right so that the fit is what you'd like it to be. 3. If you don't have wrap-style covers, you'll have to use a snappi or some pins-another learning curve to master. Flats: A flat is a large square of a single layer of fabric, often bird's eye cotton; many cloth diapering parents also like to recycle flannel receiving blankets by using them as an inexpensive flat option. Like the prefold, it has no elastic or closures of any kind. 1. Flats are the cheapest cloth diapering option available. 2. They wash up really well, thanks to the one layer of fabric. 3. Because they are one layer thick, they dry extremely fast. So fast in fact, that you can often skip the dryer completely and save a little more money on that bill. 4. While learning to fold them is very tricky, they can be pad-folded into a wrap-style cover and used effectively that way. 5. Flats are pretty much "one size fits most." 1. Unless you're pad-folding, you'll have to master the fine art of folding a flat. This is definitely not always an easy feat, but it can be done. 2. As with the prefolds, you'll have to learn to use a snappi and/or pins to close these diapers. 3. Until you get the hang of folding, you may not get a great fit.